There are several types of filtration methods to choose from, which include gravity or simple, hot, and vacuum. Selecting the right method depends on the nature of the experiment. This guide will provide you with an easy to follow set of criteria that will help you choose the right filtration system for the job. The following chart is useful in getting you started. Do you intend to collect a filtrate or a solid? How much of the solution do you need to filter? 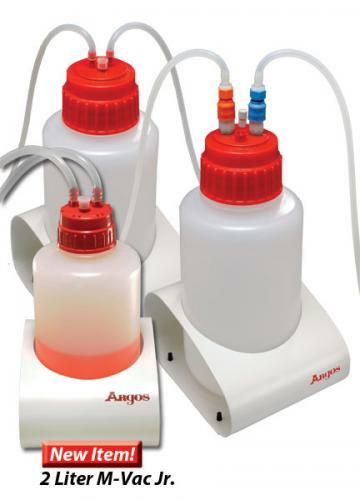 Large Volume – Gravity filtration is the best choice, because it’s fast, but may need to empty the flask several times during the process to release pressure. Small volume – Gravity filtration is the best choice, and there is no need to remove the funnel, so the risk for slowing process down or spills is minimized. How much of the solid is being collected? Large Amount – Vacuum filtration system is the best method for filtering solids. Yes – Use Vacuum filtration system, because regular filtration methods will be too slow. No – Regular filtration systems may suffice. Are you looking to avoid crystallization in the filter funnel? No- Hot filtration is not needed. The first step is to choose the right sized filter paper, which is the most vital step for vacuum filtration, because the filter must be smaller in diameter than the Hirsch or Buchner funnel. It needs to cover the holes and sit flat on the funnel bottom and not have any creases or folds. There are two ways to fold the filter paper, which are the fluted and conventional methods. For the fluted method, simply fold in half, open, and then fold in half at a 90-degree angle to the original fold. Align adjacent folds and then make new folds by bisecting the previous fold to make a fan like arrangement. Next, pleat into a fan by making folds to each section is in opposite directions to the next fold segment. The result is a fan like arrangement. Fluting methods maximize the rate the liquid flows through the paper, because it increases air flow into the flask along the sides and surface area. The fluted method permits fast pressure equalization. The simple or gravity filtration method is the most used and is great for removing a solid material that is insoluble from the solution. The solid is potentially the required result or an additive, like a drying agent, or impurities are the results. A fluted or conventional filter paper is placed in the filter funnel and placed in the neck of a ring or clamp stand or Erlenmeyer flask. The solution can then be filtered carefully and slowly through the funnel. Make sure to not fill the funnel above the edge of the filter paper. IMPORTANT: Do not heat organic solvents in a Bunsen burner, use a hot plate, or use a hot water bath that is on a hot plate. When crystals begin to grow in the filter funnel during gravity filtration, it can block the funnel or stop the filtration process. To avoid this issue, hot filtration, which heats the whole filtration apparatus, can prevent the solution from cooling and forming the crystals. The process of hot filtration is best done with a fluted filter and a stemless filter funnel. The stemless filter funnel should be supported with an iron ring clamp, if it is not secure. The filtering action may be slowed or stopped by pressure that may build up in the flask because of the hot vapors. Fluted filter paper will reduce the risk of this happening. A hot solution should be quickly filtered using the fluted paper in the stemless filter funnel and into an Erlenmeyer flask. A small piece of paper or wire placed between the Erlenmeyer and funnel will prevent a seal from forming and pressure building up. If crystals begin to form in the filter funnel or paper, a few drops of solvent in the Erlenmeyer, funnel, and paper, can be heated on a hot plate or steam bath. A hot solvent may be introduced to remove any of the crystals that appear on the filter paper. IMPORTANT: Test-tube holders or metal tongs should not be used to hold the hot flask, while pouring in the liquid, because it can be easy to drop. Instead a simple holder can be made of a paper towel that is folded into a strip. It can be pinched around the flask’s neck. During this method, the solution is filtered through the filter paper using a vacuum in a side arm adapter in the filter flask. This is generally the most efficient and fast way of filtering. The collection of crystals is done through the swirling of the mixture of liquid and solid and then pouring it into the filtration apparatus quickly. The filtration apparatus consists of the Buchner funnel that is fitted with the right sized filter paper a clamped flask with a conical filter adapter, and a vacuum that is applied in the side arm. If there is a smaller quantity to filter, the Hirsch funnel and small filter paper should be used. A test tube that has a side arm can replace the filter flask and should be clamped. The vacuum will be applied to the side arm with vacuum tubing. To filter the crystals, the apparatus should be assembled by making sure that the funnel is sealed. The aspirator is turned on, the filter paper is moistened with a cold solvent, so the paper adheres to the funnel. This prevents the crystals from seeping out under the paper. The liquid is filtered, and the crystals can be rinsed with a cold solvent. The crystals can be dried by leaving them in the apparatus for a few moments. IMPORTANT: The tubing should be disconnected before the aspirator tap is turned off. Vacuum filtration is a great way to separate liquids and solids. However, if the aspirator is turned off prior to the tube being removed, there is a potential for the water to be drawn from the aspirator into the filter flask. This can contaminate the filtrate.